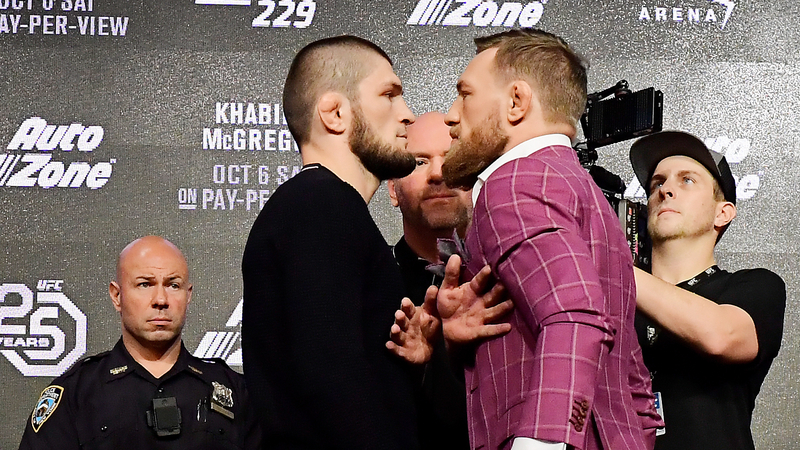 NEW YORK — Ever since his “notorious” April bus attack, Conor McGregor has kept his vitriol for Khabib Nurmagomedov bottled up, waiting to confront his adversary face to face one more time before their Oct. 6 clash at UFC 229. When that moment arrived Thursday during the Khabib vs. McGregor press conference at Radio City Music Hall, McGregor returned to the scene of the crime (or at least the city where it took place) and went after Khabib again. McGregor unleashed an obscenity-laced verbal assault on Nurmagomedov that lasted from the minute the conference started until it was over roughly 36 minutes later. “I came back for the love of fighting, the love of war, and I’m going to truly, truly love putting a bad, bad beating on this little glass-jawed rat,” McGregor yelled, with a bottle of his own Irish whiskey by his side, before continuing his animated tirade, all the while making sure to keep the insults coming at a dizzying rate. Every insult that he spewed at Nurmagomedov was a soundbite of its own in the circus-like atmosphere, proving the Conor McGregor show is back. To all of that, Nurmagomedov simply said that he was here to “smash” McGregor when they fight. From there, McGregor brought up his April attack on Khabib’s bus inside Brooklyn’s Barclays Center, a topic that was broached several times during the press conference. Khabib wrestled verbally with McGregor about the attack, asking “The Notorious One” why he was able to slap McGregor’s friend Artem Lobov without any retribution. The slap prompted McGregor to fly to New York and attack the bus prior to UFC 223. He aimed for Nurmagomedov with a dolly but instead hit two other UFC fighters and company personnel with the glass from a shattered window. The bus incident was the very reason White and the UFC chose to hold Thursday’s press conference in front of media only, without any fans present. McGregor did stop his onslaught briefly to announce his Proper 12 whiskey, a small bottle of which he sneaked into the pocket of his purple purple suit jacket, and call it a “direct competitor” to Jameson. That was preceded by McGregor cutting an impromptu commercial for the brand. “It is the finest man-made Irish whiskey there is on the market,” he said as he did his best salesman pitch. “None of that Jameson s—.” And he had reason to celebrate as White confirmed to ESPN after the press conference that McGregor had signed a new eight-fight deal with the UFC. Terms weren’t disclosed. The contract begins with the fight against Nurmagomedov. He even offered a shot to Khabib, who said he doesn’t drink. Later in the press conference, Khabib vowed that whiskey won’t help McGregor on Oct. 6, to which McGregor burst out laughing. When Nurmagomedov promised to “put him back to boxing,” referring to McGregor’s 2017 boxing bout with Floyd Mayweather Jr., and his last UFC fight being in November 2016, Conor mocked his opponent’s broken English. McGregor rejoiced when White confirmed that Proper 12 will be an official sponsor of UFC 229, vowing that the company’s logo will be mixed with Nurmagomedov’s blood by the end of the night. Whether that comes to fruition remains to be seen. No MMA fan would choose Khabib over Conor in a war of the words. It was fully expected that McGregor would trash talk Khabib to no end on Thursday — something the Irish showman absolutely relished. Yes, it’s good to have “The Notorious One” back in all his bluster, pomp and glory on the mic. Now, if he can back up that trash talk up in the Octagon, after a nearly two-year MMA absence, then McGregor will truly be back.